Still around. 86. Lives in Tampa Florida. Good read for anyone never previously interested in eye sign , but old hat for those who have been interested for many years. Most who have been interested for many years have come to realise that there are thousands of pigeons with ideal eye sign according to the theory that are rubbish and some with inferior eye sign according to the theory are very good. Just look at the champions photographs in the sports publications and some of them would be dismissed as rubbish if considered on the eye sign. You have certain breeds with nearly every pigeon having good eye sign, the Jan Ardens being one and the old Sions another. 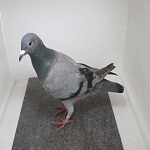 I have won many eye sign shows and also judged them and it is a very interesting subject but the best way to evaluate a pigeon is in the actual races which do not lie and are irrefutable. I agree 100% Misty. Just thought it may help some one. Wise assumption Hal Pigeons being pigeons thou & certain fanciers being as they are etc we always will have the believer types in the eye sign factor I suggest . The best part was the segment "starting a family". Sound advice. 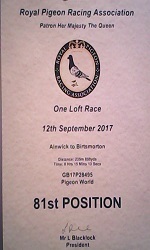 True & never raced a pigeon in his own back yard etc on his own in his life time Hal that I know of, by what I have read as such. Subject: Re: Eye sign tutorial.